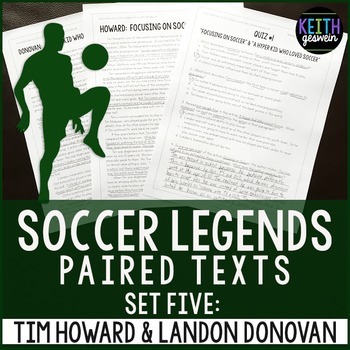 This resource includes paired texts about two of the most famous soccer players in USA history -- Tim Howard and Landon Donovan. These passages will help your students learn how to analyze similarities and differences between two texts. 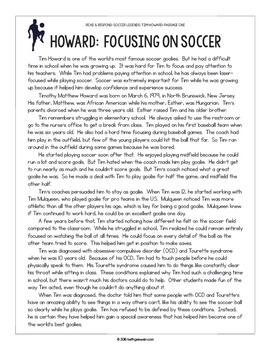 Pages 2-14 contain the passages, quizzes, and prompts in a smaller font size so you can save paper. Pages 16-39 contain the same resources in a larger font. Use whatever best helps your students! Look at the preview for more information. 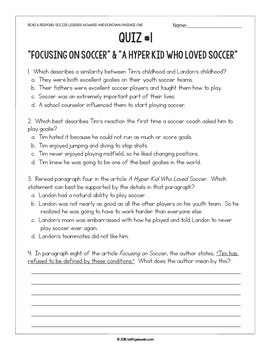 Quizzes are written to match the level of rigor required by CCSS while not being too confusing for students. 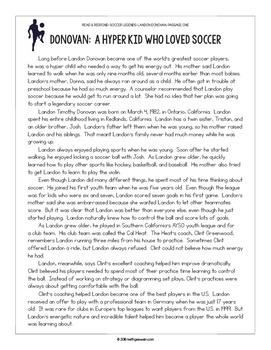 The questions assess many CCSS-ELA standards and elements of nonfiction, including vocabulary, cause and effect, citing evidence, summarizing, sequence of events, comparing and contrasting, and much more. Note: The preview download will have watermarks and only shows the first set of texts. Your actual product download will not have watermarks. Please remember, this purchase is for the use of one teacher. It is not intended to be shared. Please purchase an additional license if more than one teacher will be using it.